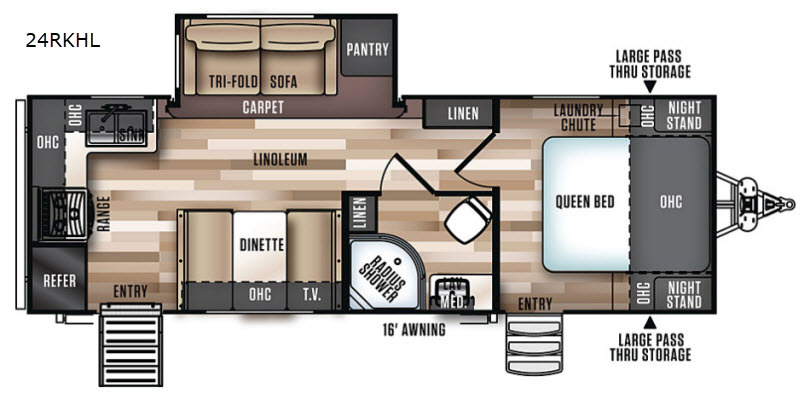 For a functional travel trailer you will want this Salem Hemisphere Hyper-Lyte 24RKHL that features a single slide out to provide more interior space. With two entry doors you can enter through the rear door and you will be in the kitchen area or the front door will lead you into the private front bedroom. This rear kitchen has everything needed to create the meals that you desire while you are away from home. Within the slide out there is a tri-fold sofa which can double as additional sleeping space, if needed! Outside you will find a 16' awning as well as a large pass through storage area and more! 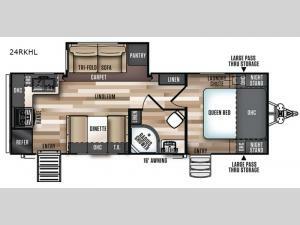 When the campground is calling your name you will want a Salem Hemisphere Hyper-Lyte travel trailer! These models are stylish with a gel coated fiberglass exterior and a feature a Norco cable slide out system and Dexter axles. In the bedroom you'll appreciate dual USB ports on both sides of the bed and strut lifted storage under the bed for all your luggage. The added touches throughout the kitchen include a 10.7 cu.ft. stainless steel Everchill residential refrigerator, a stainless steel microwave, plus Shaw Guardian Hickory Way linoleum. The living room will be a gathering place with the Jensen 32" LED TV with Bluetooth CD/DVD/FM/USB player and bar speakers.